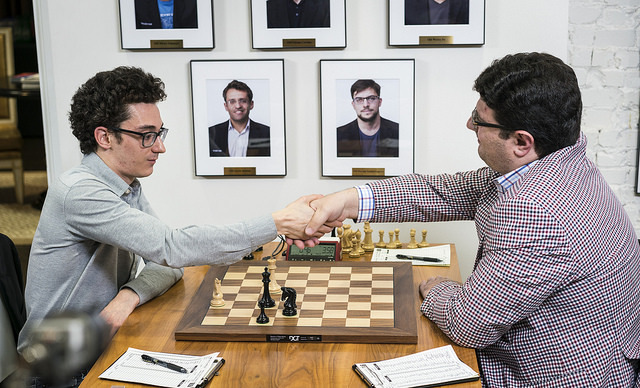 “I went crazy at the end”, said Fabiano Caruana after rejecting a draw offer and going on to lose to Zviad Izoria on Saturday. That cost him 7.6 rating points and a share of the lead, while it almost got worse in Round 5 when he admitted he was “still a bit tilted” as he played a bad improvised novelty against Sam Shankland. 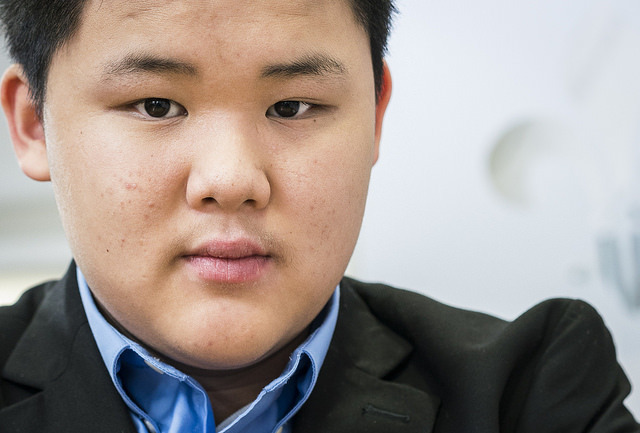 He held on, and the good news was that his big rivals Wesley So and Hikaru Nakamura were also struggling, with Hikaru yet to win a game in the event. Nazi Paikidze and Annie Wang lead the women after winning in Round 4 and escaping lost positions in Round 5. 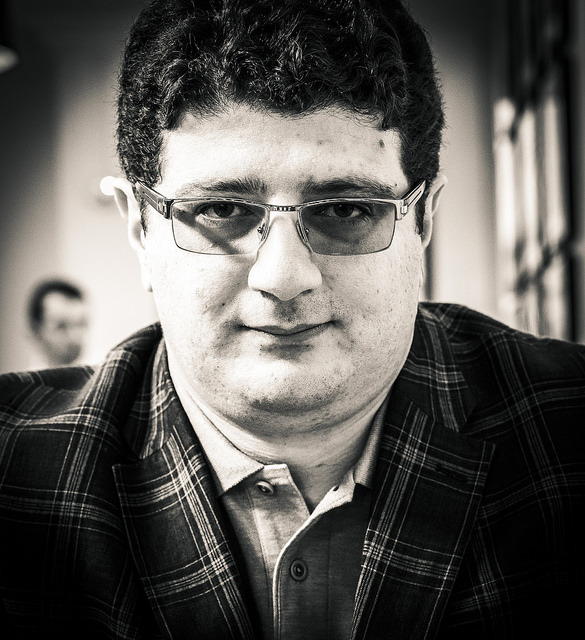 A loss to Sergey Karjakin aside, Fabiano Caruana seemed to have been able to do no wrong for the last two months. He won five games in the Candidates, four games in the GRENKE Chess Classic and despite having almost no rest in between he was back on a roll in the US Championship. 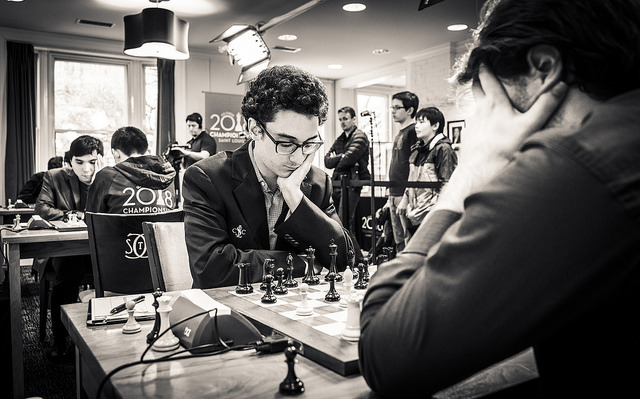 He steamrollered Aleksandr Lenderman in Round 2 and then seemed to have mastered the art of controlled risk-taking against weaker players as he beat Jeffery Xiong with Black in Round 3. He’d closed to within 15 points of Magnus Carlsen and had White against the unfamiliar figure of Zviad Izoria in Round 4. Fabiano underestimated Zviad. He was really good slightly before Caruana started getting good, so I think Fabiano just underestimated him. I remember Zviad playing the HB Global back in 2005, and in the World Youths before that. He was a very strong, a very talented junior, and I think Fabiano just got overconfident and felt like he could do no wrong, especially after what happened in the last two events. It bodes poorly for the match, because Magnus is very good at drawing out games, and you think of the game yesterday against Zviad, and last year the game against Varuzhan as well, so I think he just got overconfident, but I think that’s one of the big weaknesses that Fabiano’s going to have to work on for the match, certainly. This year’s game was a fascinating double-edged struggle in the Italian, with Caruana following the same approach as against Xiong of pushing his f-pawn to generate an unclear position. Zviad reacted well and had a long-term strategic plan of manoeuvring a knight to the perfect e5-square, but he instead took advantage of a momentary weakening of White’s grip on the centre to play 45…f5!? I would be relieved with a draw, especially after b3 happened. I got a bit ambitious, then the position kind of sterilised and I was fine with the draw, but I still wanted to make a few more moves and just get all the pieces off the board, so when he offered it I was a bit upset, because part of me wanted to accept it and part of me still wanted to play a few more moves, and the part of me that wanted to play a few more moves won, unfortunately, and then I thought that we were cleaning up the pawns, but I just started blundering pretty much everything. I don’t know why I gave my g2-pawn, why I did any of this, it was just bizarre! Obviously at the end of the game my head was just not working properly, but ok, when you do things like this you deserve to lose. The mind is a very fragile muscle – sometimes you can’t control your mind. Ask anyone who plays chess! An apologetic Zviad said afterwards, “I feel bad for winning that kind of position, but what can I do?” He had no reason to feel bad, though, since his play in the latter stages was absolutely flawless, including playing confidently and keeping an edge on the clock. A lot of his moves just didn’t make sense to me, but a lot of the time I play with Ray his moves don’t make sense and I lose! This wasn’t one of those occasions, since Ray went for tactics that didn’t work and was duly punished. That took Sam level with Wesley So and Varuzhan Akobian in the lead, while in Round 5 he had the white pieces against Caruana. He’s obviously a much better player than me, but if the best player always won chess would be a very boring game! There was nothing boring about how their game began, since after just a brief pause on move 7 of a Queen’s Gambit Accepted Caruana blitzed out 8…g6?! This was the World Championship challenger we were talking about, so no novelty could be taken lightly, but Sam didn’t waste too much time before continuing 9.Nc3 Bg7 10.d5! It’s just a bad move. I’m not surprised that nobody played it before because it’s just a bad move, and Sam sort of showed why. For some reason over the board I thought it looked interesting, and then I started to wonder why I played it. Of course I can play 8…Be7, but I don’t know, I wanted to do something different, and obviously I was still a bit tilted. I never had compensation. I just methodically tried to trade pawns. It was such a bad ending! I’m pretty much convinced it was losing at some point, though I didn’t see a clear win. 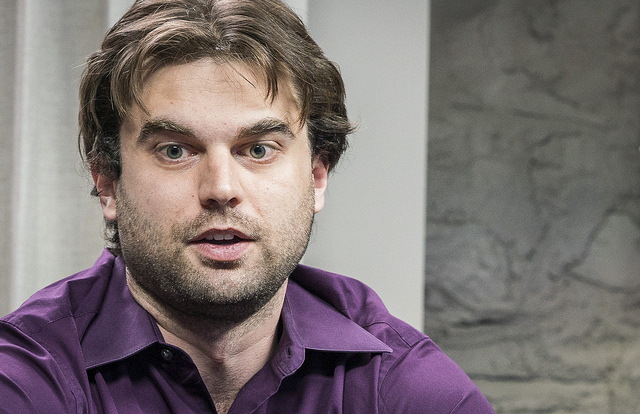 Shankland had 17 minutes to consider his position, while his opponent was down to under a minute for the final move before the time control. There were various options, including 40.Rxa5 or what Fabiano called the “very concerning” 40.Kh3, when it might come down to a single tempo, but instead Sam gave away all his kingside pawns with 40.Kg4?! Rxg2+. Caruana felt White should “never go for this” unless he’d seen some concrete play against the black king, but it turned out there was nothing and the game ended in a draw four moves later. This is the second year in a row I’ve had Caruana in awful shape, but was never quite completely winning and didn’t put him away. But look, a lot of people get good positions against him. He wouldn’t be who he is if he just lost them! Now that it’s over I kind of wish that I tried a little more to beat them… Now I think that maybe I should try harder and maybe win a game or two against them eventually! That’s likely to come. Another player who ultimately did well against the stars is Aleksandr Lenderman. 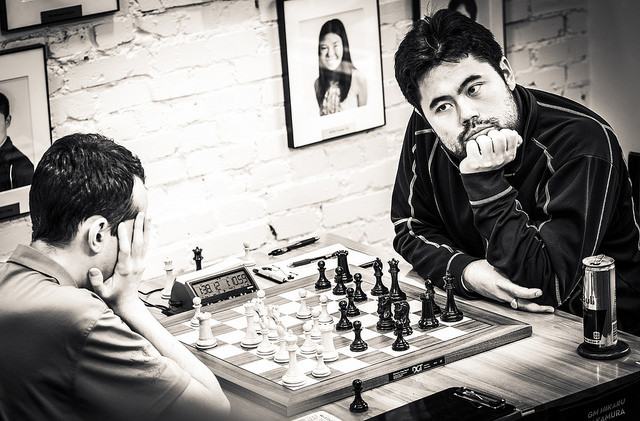 Despite getting crushed by Caruana he bounced back to play excellent games against Wesley So and Hikaru Nakamura in Rounds 4 and 5. In both he put his opponent under serious pressure at some point before ultimately drawing. It should get easier from here on for both Awonder and Aleksandr, with the latter vowing, “I certainly don’t plan to be a pushover with either colour in this tournament”. That’s kind of the problem. We’re so much higher rated than everyone else that if we don’t try to win with both colours we’re just going to lose rating points, so I think we’re all trying to do stuff that we normally would not do. I mean, what I did today, I would not do against Magnus or some other people. What Fabiano did today I can guarantee he would never do that against Magnus, Anish, anyone, really! We’re trying to take risks with both colours, and when you do that if your opponent plays very well or is well-prepared you can get into a lot of trouble, and then that’s what makes it so hard to win games here. In honour of Wesley So liking all my food pictures....dinner last night! Round 3 of the women’s section had been explosive with five decisive results, but they managed to improve on that in Round 4! 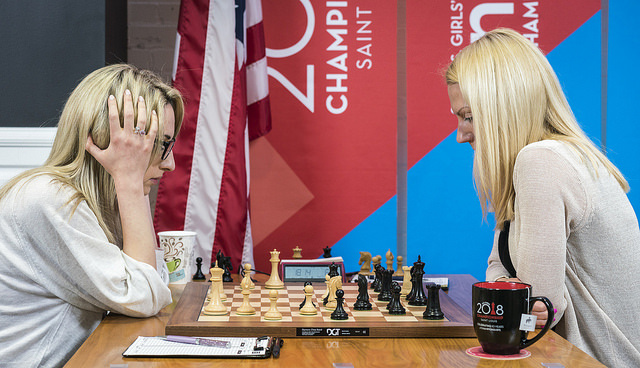 In fact there was a chance for Anna Sharevich to hold on with 24…Ng8! !, but her opponent described that as “just not a human move”. The game finished 24…Qe5 25.Nf5! Nxd5 26.Bxd5 Rxd5 27.Qa4+ and with mate-in-4 on the board it was time to resign. That was a big turnaround for Anna, who had beaten Irina Krush in such style the day before, while Irina also saw her fortunes turn 180 degrees! I decided to play 26…Qe7! and then I touched the knight! The "touch-move" rule meant she had to go for 26…Na7?! when after 27.Ne5! Black was in trouble, with the white rooks and queen ready to invade the black position. In the end, though, Irina was left frustrated with a draw, and the only decisive game, Goletiani 0-1 Feng, changed nothing at the top of the standings. The last round before the only rest day sees leaders Akobian and Shankland meet, while despite what happened to Fabiano you have to look at So-Izoria as a good chance for Wesley So to take a step towards defending his title. The other games with the Big 3 are Robson-Caruana and Nakamura-Xiong. Follow all the action from 13:00 CDT (20:00 CEST), with live commentary from Yasser Seirawan, Jennifer Shahade and Maurice Ashley here on chess24.